This black bean miso paste recipe is an American-style miso or "modern miso", a non-traditional version utilizing black beans as opposed to the customary soybean selection. It is made the same way you would make Asian varieties; you simply substitute black beans instead of soy. 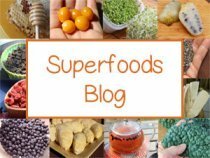 This can not only be a preferred option for those trying to avoid soy products, it also tastes absolutely delicious using this legume option. When making a homemade miso paste, is important to know going in that there is a good amount of waiting required. Although the actual bean/koji preparation itself takes only a portion of a day, including the bean cooking time, miso is a fermented food that needs to culture over a period of time. 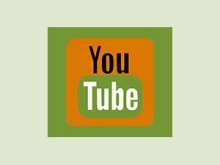 Learn more about miso on our miso page. The reason why most people don't try to make their own, at least here in the U.S., is due to the fact that it takes at least 6 months or longer to achieve the final end result. As far as fermented food recipes go, it requires an extended amount of time for the initial mixture to fully mature into a thick, rich savory miso paste filled with beneficial nutrients. 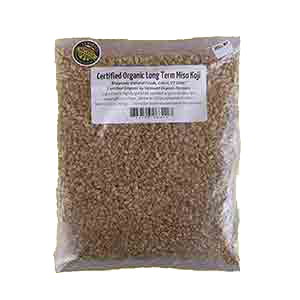 These versions are often referred to as "red miso" because of their long-term aging process. 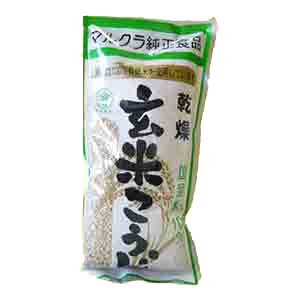 This is in contrast to a "sweet miso" or "white miso" which is only aged between 4-12 weeks. Technically speaking, a "red miso" is considered mature after 6 months when it has gone through at least one summer season. We ALWAYS, however, ferment our homemade miso for one full year. So, if we packed it in February we would decant it in February the following year. From our experience, this seems to produce a better miso with deeper flavors and a little less saltiness. These longer-aged miso pastes are known to be much higher in health enhancing substances, like dipicolinic acid, which is produced over a period of time by the lactobacillus bacteria. Dipicolinic is an alkaloid that is specifically known to help chelate heavy metals and radioactive isotopes from the body. Why Make Your Own Miso? Although there is a bit of waiting required, making your own miso paste from scratch allows you to have direct control over the type of legumes you'd like to integrate. In this case, black beans are the base used in this recipe. They are one of our personal favorites, next to garbanzo bean or the chickpea variety, producing a nicely aged texture and full-bodied flavor. 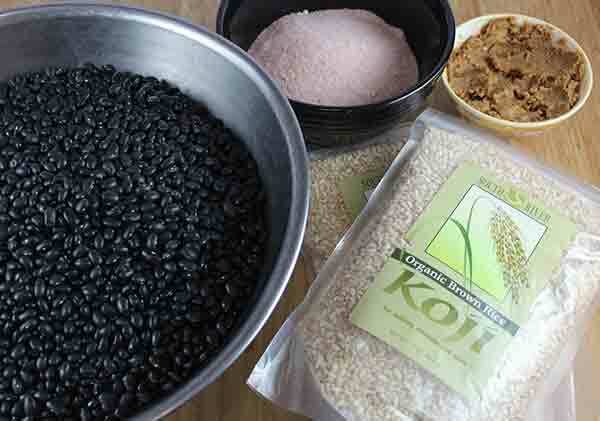 A black bean miso paste recipe is also very cost effective when you consider the high price of commercial unpasteurized soy-based miso products available. You not only get the opportunity to use quality ingredients, but one single gallon or 5-liter crock can literally cost as much as three 16 ounce tubs of store-bought miso, with one batch yielding between 8 to 12 16oz portions. Once you decant your first crock of mature miso, you can make another to replace it, guaranteeing a continuous ongoing supply throughout the year! While many might assume that a homemade miso naturally creates its own saltiness, this is not the case. Salt is added to the bean and koji mixture, without it the miso would rapidly putrefy. 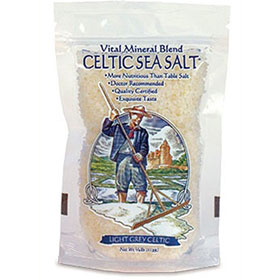 Salt essentially protects it from unwanted bacteria and still allows for the incubation of beneficial lactic acid bacteria necessary for culturing the initial paste. 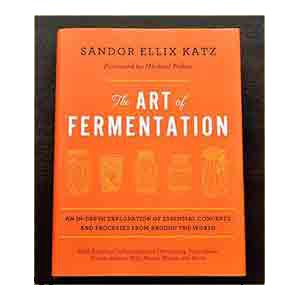 The saltiness of a miso will mellow over time as it ferments. 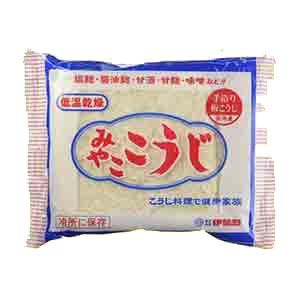 For example, a 6-month old miso can be quite salty, if fermented longer it will become less so and develop other desirable flavors. The amount of salt incorporated directly corresponds with the length of time you intend to ferment it. 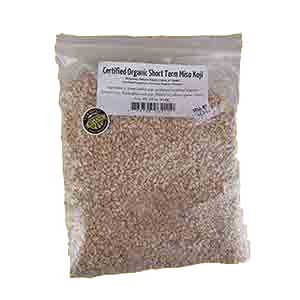 Generally, longer homemade miso ferments require more salt but less koji per ratio of cooked beans compared to short-term sweet misos. 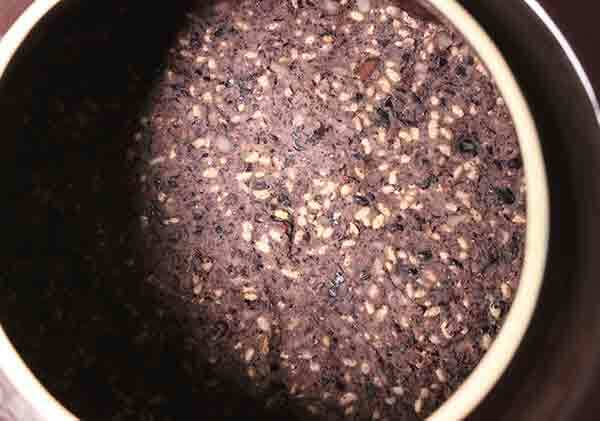 We try to use as little salt as possible in this black bean miso paste recipe, a proportion of which (from our experience) produces a very nice miso after a total of 12 months of fermentation. 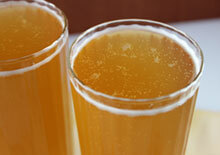 We usually encourage one full year as the flavors are much richer and diverse with less saltiness present. 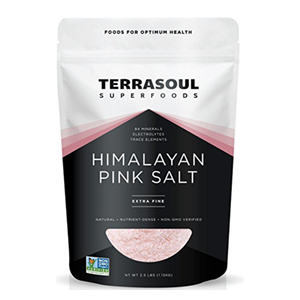 It's best to use a high quality sea salt or pink Himalayan salt, not table salt which is highly refined. It is important to soak beans overnight, or about 8 hours, in plenty of water to ensure they are completely covered as they expand. In other words, you want all the beans evenly soaked so they cook up consistently uniform. After soaking, strain the liquid and rinse one more time in pure filtered water and proceed to cook on low heat for several hours or until soft. The best way to make beans is in a crock pot or pressure cooker as this speeds up the cooking time considerably and produces a nicely textured legume. You want the beans to be firm but soft when you pinch them between your fingers. After the beans have completely cooled, they can then be hand mashed or food processed into a paste-like texture. The most important thing when it comes to making homemade miso is that you want to ferment it in a space that will not be opposed to extreme temperature fluctuations, but somewhere that is not totally controlled at a consistent climate all year long. Usually a cellar, basement or at the back of a pantry space is ideal, locations that don't experience a lot of foot traffic. This region of your home should also be somewhat dark, away from direct light exposure. While miso is rarely affected by contamination, it is a good idea to prepare it in the cooler seasons when airborne organisms are less likely to be present during the initial stages. This is when it is most susceptible. 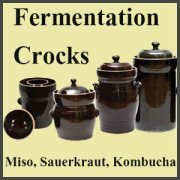 Fermentation Crock - This could be as simple as a gallon glass jar, which is what we used for many years before purchasing a professional fermentation crock. These are ceramic vessels specifically made for cultured foods, like miso or cultured veggies such as kimchi. Clay or ceramic crock pot inserts also work well. 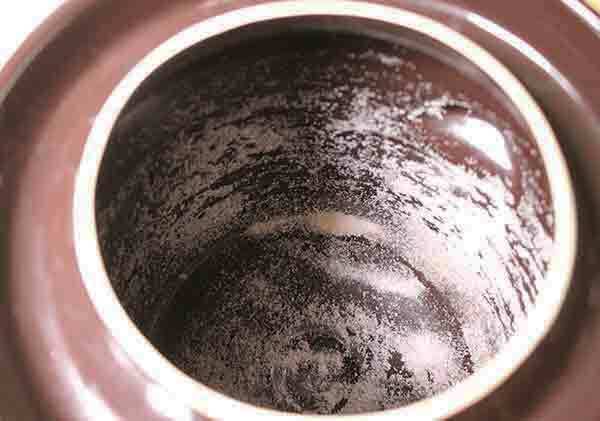 It is best not to use plastic or any kind of metal as these materials can leach into the miso or can be corrosive. Weights or A Heavy Object - Professional crocks usually come with heavy weights which can be a more convenient option. But, you can also get creative and make your own using a large jar of water or a clean heavy rock placed on a ceramic or glass plate on top of the salted miso layer. 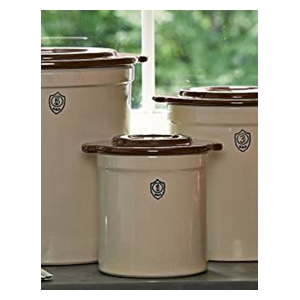 Large Cooking Pot - Since you will be cooking between 12-16 cups of black beans, an unusually large portion, it is nice to have a large cooking pot, pressure cooker or crock pot available. Alternatively, you can divide the recipe between two smaller pots if needed. 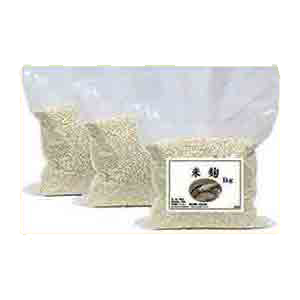 Bowls, Masher/Food Processor and Strainer - Large mixing bowls are best for mashing the beans and integrating the rice koji. A large strainer or colander is also needed to throughly strain out the bean liquid. You can hand mash the cooked beans (traditional-style) with a potato masher or use a food processor. 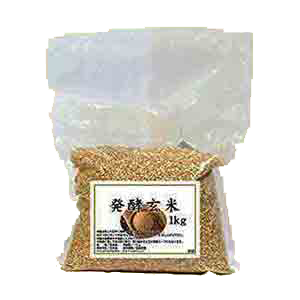 Unpasteurized Miso - Also referred to as "seed miso", this is active miso that helps to initiate the process of fermentation. 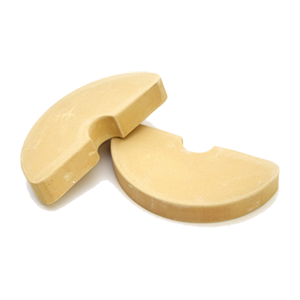 You can purchase unpasteurized varieties in some markets or eventually use your own from previous homemade miso batches. Make sure beans have thoroughly cooled before mixing them with the koji, as high heat above 140°F or 60°C will destroy the spores. Miso should be tightly packed into the fermentation crock and weighted to ensure no unwanted air pockets or an oxygen-free environment. 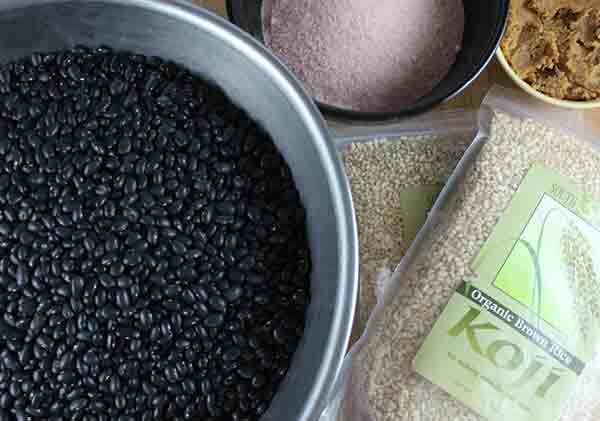 Begin your black bean miso paste recipe in the colder seasons, either the spring or fall for best flavor and less risk of possible contamination. Thoroughly wash all equipment and tools in hot soapy water and dry before use. 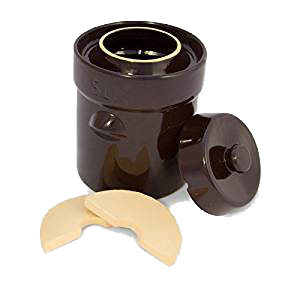 Store your miso crock in a well ventilated space in a dark location out of direct light exposure. 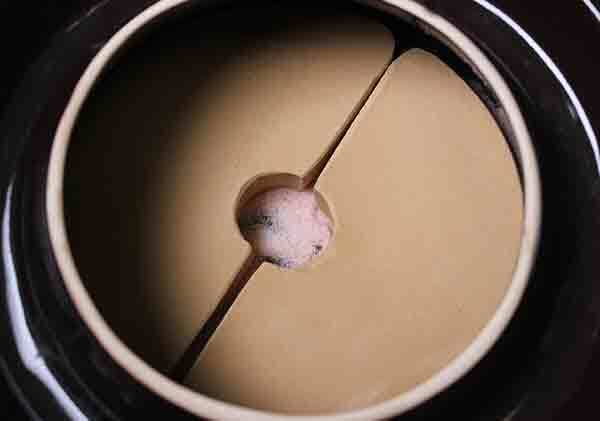 Never ferment miso in with a tightly fitted lid, as it can build up pressure and potentially explode. Soak the black beans overnight in plenty of water to thoroughly cover them as they absorb moisture. Strain, rinse and cook the beans in water until soft. In a colander strain the cooked beans, putting aside the specified proportion of bean cooking liquid. Allow the beans to cool enough so they are still slightly warm for mashing or processing. While the beans are cooling, dissolve sea salt into hot cooking liquid to make a brine. When the beans are cool, mash them using a potato masher, other tool or a food processor. 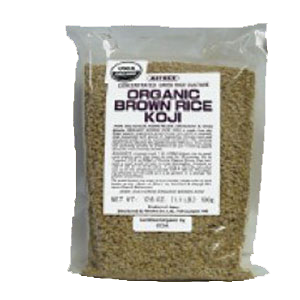 Mix together the salty brine liquid with the rice koji and unpasteurized seed miso. 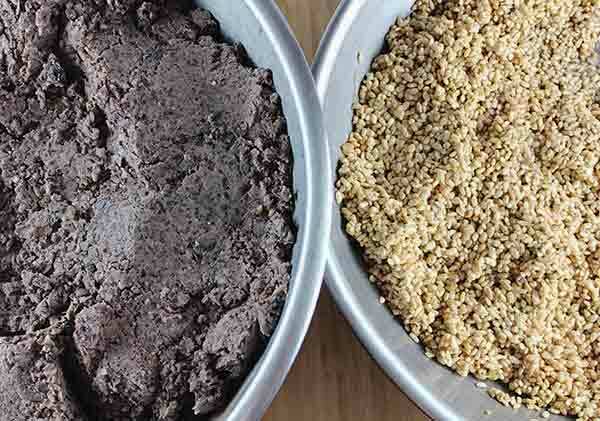 In a very large mixing bowl, mix together the koji mixture and mashed black beans. This can be accomplished using a large spoon or spatula, but is traditionally done using clean hands as its a lot easier to thoroughly integrate. 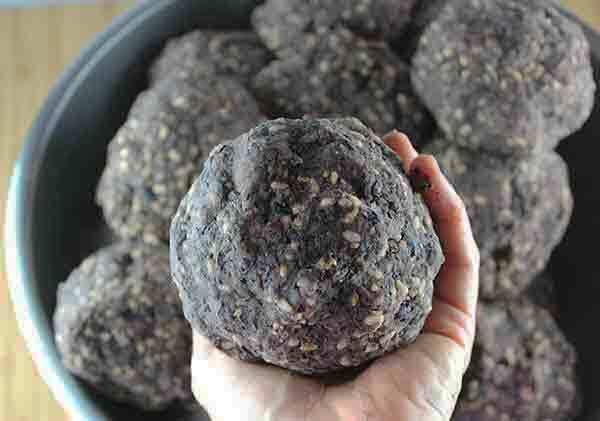 Miso is customarily formed into large balls with clean hands and "thrown" into the salted vessel to ensure no air pockets are present. Throw in about 6 balls then firmly pack them down with the back of your hand, repeat until the crock is full. Sprinkle a layer of salt on the top surface of the packed bean/koji mixture. 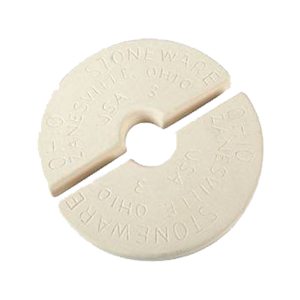 Add ceramic fermentation weights or a plate/ceramic disk and weighted object. Cover with a loose lid and/or clean cloth. 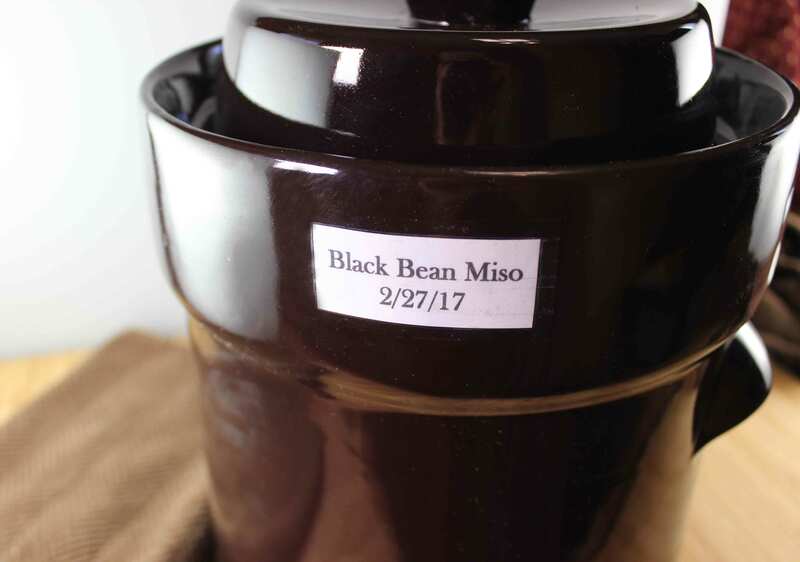 Always label and date your miso! 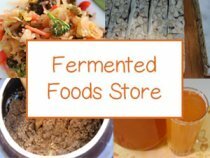 Ferment in a dark location away from major foot traffic. If for some reason your bean/koji mixture seems too dry, add more bean cooking liquid in 1/4C increments until you get a desired texture or a ball-forming consistency. 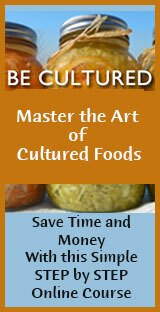 The ideal time to ferment miso is in the spring or fall seasons. It can be taste-tested after one summer season and decanted OR you can continue the culturing process for increased benefits and flavor. The finished mature miso should have a thick consistency like mashed potatoes and a rich tamari-like aroma. 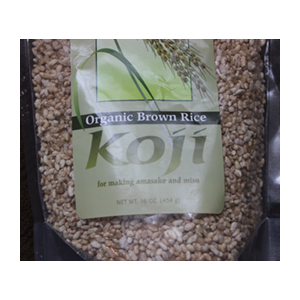 The texture should be smooth and the koji rice thoroughly dissolved or at least partially broken down. Tamari liquid is often produced as a bonus when making miso, it can be drained off and used like soy sauce. This black bean miso paste recipe produces a delicious, pungent, thick paste that can be used to flavor soups, sauces and other savory dishes. 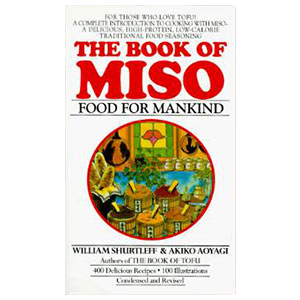 For additional information about miso we recommend The Book of Miso as well as The Art of Fermentation, two excellent resources.